SJS alumnae who played in the game included from left to right: Grace Larson, Faith Koszewski, Megan Geraghty, Karoline Lucas, Angelica Naber and Shannon Kennedy. 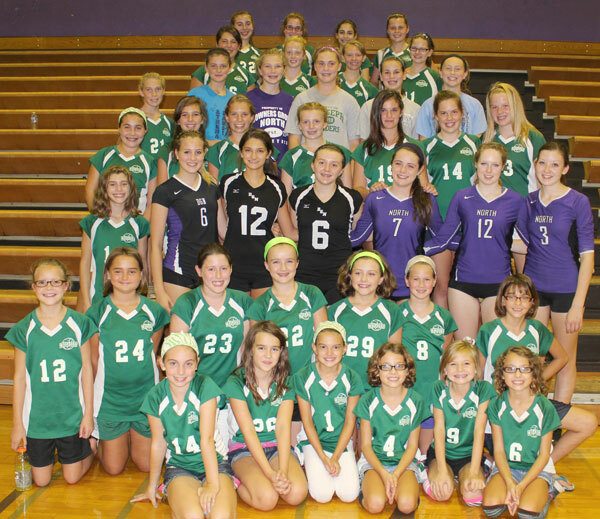 Volleyball mini-camps for girls entering 5th through 8th grade will be held this June for all St. Joseph girls who register to play volleyball this fall. While the mini-camps are not mandatory, they are highly recommended. Our mini-camps will help to prepare girls for evaluations. All camps are held in the SJS gym. Players should bring athletic shoes for use in the gym and a water bottle. NO spandex or yoga pants. NO jewelry, especially earrings. Kneepads are highly recommended. The head coach for your child’s grade level as well as other assistant coaches will direct camps. The cost is $20.00 per student athlete for the instructional camp and includes a camp T-shirt. 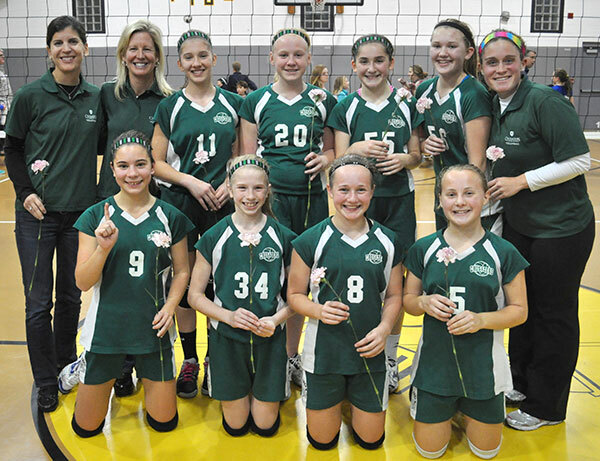 Mandatory evaluations for team splits for St. Joseph Crusader Volleyball will be held for all girls who will be entering 5th through 8th grade. The evaluations are held in the SJS gym. All students playing volleyball this fall MUST ATTEND as this is the only evaluation date for each grade level. Team practices will begin in August and the league will begin play the weekend following Labor Day. Dupage Parochial League 7A CHAMPIONS! Our 7A Lady Crusaders took down the mighty St. Michael’s Lancers last night in an exciting match!! CONGRATULATIONS to the girls and the coaches! SJS is proud of YOU!! Here are the season highlights! 8A came in 1st in the silver division at the Benet tournament and came in 2nd at the St. Pius pre-season tournament. 7B took a 1st in their division at the Peter & Paul tournament. 7A placed 1st in the St. Francis tournament and placed 2nd in the Montini Bronco Bash. 6B1 & 6B2 set a goal to learn a 6-2 offense this season and near the end of the season were running the offense beautifully!! Both advanced to the second round of the playoffs. 6A came in 1st in the Montini Bronco Bash and came in 1st in the Halfway to St. Patrick’s Tournament. 5B won the first game of the season to kick off their crusader volleyball careers, had a successful regular season and lots of fun! 5A took 1st place at the Montini Bronco Bash AND collected $400 for cancer research in honor of their teammate, Mikayla S.
From our 8 teams, 5 advanced to the second round of playoffs and only ONE team advanced to a championship game and that was 7A! They beat St. Michaels in a very exciting match to win the 7A championship! CONGRATULATIONS to all the teams on an awesome season of VB!! Way to go LADY CRUSADERS! !